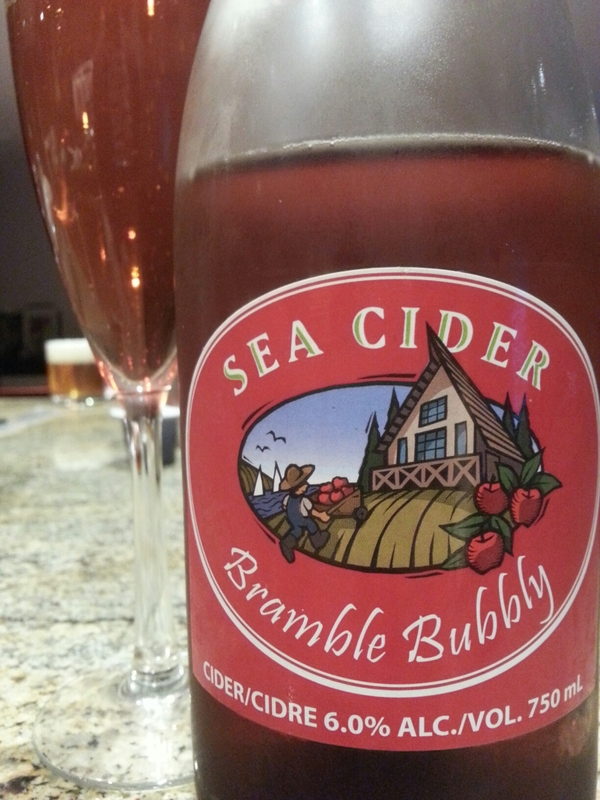 Bramble Bubbly – Sea Cider (Saanichton, BC, Canada) | Justintoxicated. “The mighty blackberry is a tenacious invader of Vancouver Island orchards, but a touch of its sun-soaked sweetness added to apple cider makes for a sinfully delicious blushing semi dry sparkling cider. Raise a glass of Sea Cider’s Bramble Bubbly, and celebrate Vancouver Island fruit at its best! Bramble Bubbly combines the best of BC cider apples with wild local blackberries. Vancouver Island’s native species is called ‘The Trailing Wild Blackberry,’ a cousin of the Himalayan Blackberry. Bramble Bubbly is produced by milling and juicing our apples, and adding champagne yeast to begin fermentation. Fermentation happens at cool temperatures to maximize the aromatics of the cider base. Finally, blackberries are added to achieve the rose hue and luscious blackberry flavour. Aromas, flavours: Green apple, orchard leaves, blackberries, confectionary notes. Acid/sweetness: Tart and balanced with residual sweetness. Mouthfeel: Sharp yet smooth with minimal tannins, long and viscous finish. This is an ideal sipper for the patio—thirst-quenching on its own for a summer day, or anytime with a salty snack. Bramble Bubby is perfect for a post-beach libation, and for the base of a unique sangria. Anything goes! Pairs with salmon, summer salads, berries, outdoor barbecue, mild or sharp cheeses, cured meats, and poultry dishes. Also pairs well with desserts—warm apple and berry crumble, bite-sized bonbons, or vanilla ice cream. Pairings are only limited by your imagination! Visual: (old labeling prior to 2015, cellared for 4 years). Pours pale pinkish orange with no head, ringed micro bubble retention, slow singular micro bubble streams. Finish: cinnamon, residual apple sugars, cloying finish. Summary: This one at 6% ABV is on the cloying side but still with likable fruity flavours from start to finish. The newer bottlings at almost 10% ABV should be more balanced. Cellared for 4 years–nice! I tried this awhile back but I don’t think I got a good taste of it at the event as it was the end of the bottle (room temp and it had lost its carb), as I wasn’t a big fan. My favorite from them so far is Prohibition. Bittersweet is also nice.